The Accumulator stores a limited amount of energy when available production exceeds demand, and releases it in the opposite case. The accumulator can store up to 5 MJ of energy. Its maximum charge/discharge rate is 300 kW. If connected to a circuit network, an accumulator will output its level of charge, as an integer from 0 to 100, to a specified signal. 5MJ of stored energy takes approximately 17s to fully charge/discharge at the maximum rate of 300kW. Read game-second for further time related calculations. It takes 20 accumulators (100MJ) to maintain 1MW through the night, because the accumulators don't immediately start discharging at the beginning of dusk, see the graph in this post. May be used to provide a limited amount of power (multiples of maximum charge rate) to a section of the grid. Produces light when charging and discharging. Can act as an emergency backup for the factory in case of blackout, until main power supply is restored. Can be used to power the base at night if it relies heavily on solar panels. Can act to satisfy surging demands of certain loads. If the power usage of one device exceeds production for a few seconds or so, the accumulator can provide power to the grid until said device shuts down or requires a lesser power requirement. Note that if throughput should not be limited, a power switch can be used instead. The two power networks A and B are not directly connected to each other: They are connected only through the accumulators, which are shared by both networks. This is accomplished by setting up electric poles for each network connected to the accumulators, then ensuring the sets of poles are not connected to each other (which can be done by crafting a copper wire then dragging it between two connected poles to sever the connection, exactly as is done for disconnecting circuit wires). The accumulators will only charge if extra power is being produced by network A or B. The accumulators will discharge as needed into either network if one is not producing enough power. Since the maximum input/output rate of an accumulator is 300 kW, power flow between the two networks will be limited to 300 kW times the number of accumulators (1.5 MW in the example). Note that this isolation is bidirectional: Either network can charge the accumulators, and the accumulators can discharge into either network. This technique can be used whenever this type of isolation is desired. In particular, one good use for the above technique is to limit electricity consumption in low power situations by isolating non-critical parts of your factory (such as Radar, Labs, Electric furnaces, electric miners, Beacons, etc.) from critical parts (such as lasers, ammo production, or whatever your priorities are). The rate will always be limited to 300 kW per accumulator. Because the accumulators will only receive power if you have a surplus on the main network, this will in effect deactivate the low-priority network when electricity is in short supply. 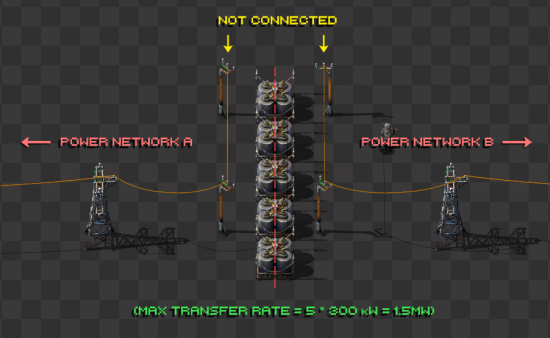 This will also limit power consumption of the low priority network if its usage becomes high, for example if you have two factories on a low priority network and usually only one of them runs at a time, if both happen to run they won't consume more than the total limit, they'll just slow down. Essentially you are saying "only deliver power to these systems if I have enough to spare, and even then don't exceed this delivery rate". In general this is a technique which works well when you've just researched accumulators and solar panels, but don't have enough resources to build big solar farms and accumulator farms yet. Reduced collision box of big electric pole to allow squeezing between it and an accumulator. Now connectible to the circuit network. Heavy optimisations by merging them into groups. Drastically slowed crafting to 10 secs. Capacity doubled, increase I/O to 300 watts. This page was last edited on 10 March 2019, at 18:48.